Deng Ai had at least two sons. Two of his sons – one of whom was Deng Zhong (鄧忠) – held village marquis titles and owned marquisates of 1,000 taxable households. Deng Zhong was killed along with his father. Deng Ai's other sons who were in Luoyang were arrested and executed in the aftermath of their father's death. Deng Ai's surviving family members were exiled and allowed to return only in 265 after Emperor Wu of the Jin dynasty issued an imperial edict pardoning them. In 273, Emperor Wu appointed Deng Ai's grandson, Deng Lang (鄧朗), as a langzhong (郎中). [Sanguozhi 48] Deng Lang served as the Prefect of Danshui County (丹水縣; around present-day Xichuan County, Henan) and then as the Prefect of Dingling County (定陵縣; around present-day Qingyang County, Anhui). He had at least one son, Deng Tao (鄧韜). During the Yongjia era (307–313) in the reign of Emperor Huai, Deng Lang was appointed as the Administrator of Xindu Commandery (新都郡; around present-day Guanghan, Sichuan). However, before he left to assume office, he died in a fire in Xiangyang Commandery along with his mother, wife and children. Only his grandson Deng Xing (鄧行), Deng Tao's son, survived the fire. Deng Ai is first introduced as a playable character in the seventh instalment of Koei's Dynasty Warriors video game series. 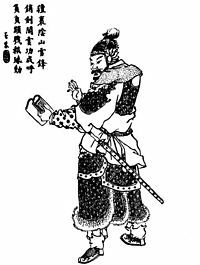 In the game, he is erroneously associated with the Jin dynasty faction; historically, he died one year before the Jin dynasty was established. ^ Deng Ai's year of birth is not clearly recorded in the Sanguozhi. However, his biography in the Sanguozhi recorded that he was 12 years old (by East Asian age reckoning) around the time when Cao Cao conquered Jing Province in 208. If we assume that Deng Ai was 11 in 208, by calculation, his year of birth should be 197. ^ The Zizhi Tongjian makes it clear that Deng Ai died in 264. However, his birth year is not incontrovertibly accepted to be 197. Therefore, 66, the age at which he died, would only make sense if we assume his birth year to be 197. ^ Vols. 73–74 of the Zizhi Tongjian recorded that Sima Yi was appointed as Grand Commandant (太尉) in 235 and he held office until his replacement by Man Chong in 239. Therefore, the time when Deng Ai first met Sima Yi should probably be in between 235–239. ^ It is not clear whether this letter refers to either of the two letters written by Deng Ai to Sima Zhao, or another letter. ^ (鄧艾字士載，義陽棘陽人也。少孤，太祖破荊州，徙汝南，為農民養犢。年十二，隨母至潁川，讀故太丘長陳寔碑文，言「文為世範，行為士則」，艾遂自名範，字士則。後宗族有與同者，故改焉。) Sanguozhi vol. 28. ^ (為都尉學士，以口吃，不得作幹佐。為稻田守叢草吏。同郡吏父怜其家貧，資給甚厚，艾初不稱謝。每見高山大澤，輙規度指畫軍營處所，時人多笑焉。後將典農綱紀，上計吏， ...) Sanguozhi vol. 28. ^ (... 因使見太尉司馬宣王。宣王奇之，辟之為掾，遷尚書郎。) Sanguozhi vol. 28. ^ (時欲廣田畜糓，為滅賊資，使艾行陳、項已東至壽春。艾以為「田良水少，不足以盡地利，宜開河渠，可以引水澆溉，大積軍糧，又通運漕之道。」) Sanguozhi vol. 28. ^ (乃著濟河論以喻其指。) Sanguozhi vol. 28. ^ (又以為「昔破黃巾，因為屯田，積穀於許都以制四方。今三隅已定，事在淮南，每大軍征舉，運兵過半，功費巨億，以為大役。陳、蔡之間，土下田良，可省許昌左右諸稻田，并水東下。令淮北屯二萬人，淮南三萬人，十二分休，常有四萬人，且田且守。水豐常收三倍於西，計除衆費，歲完五百萬斛以為軍資。六七年間，可積三千萬斛於淮上，此則十萬之衆五年食也。以此乘吳，無往而不克矣。」) Sanguozhi vol. 28. ^ (宣王善之，事皆施行。) Sanguozhi vol. 28. ^ (正始二年，乃開廣漕渠，每東南有事，大軍興衆，汎舟而下，達于江、淮，資食有儲而無水害，艾所建也。) Sanguozhi vol. 28. ^ (出參征西軍事，遷南安太守。嘉平元年，與征西將軍郭淮拒蜀偏將軍姜維。維退，淮因西擊羌。艾曰：「賊去未遠，或能復還，宜分諸軍以備不虞。」) Sanguozhi vol. 28. ^ (於是留艾屯白水北。三日，維遣廖化自白水南向艾結營。艾謂諸將曰：「維今卒還，吾軍人少，法當來渡而不作橋。此維使化持吾，令不得還。維必自東襲取洮城。」洮城在水北，去艾屯六十里。艾即夜潛軍徑到，維果來渡，而艾先至據城，得以不敗。賜爵關內侯，加討寇將軍，後遷城陽太守。) Sanguozhi vol. 28. ^ (是時并州右賢王劉豹并為一部， ...) Sanguozhi vol. 28. ^ (... 艾上言曰：「戎狄獸心，不以義親，彊則侵暴，弱則內附，故周宣有玁狁之寇，漢祖有平城之困。每匈奴一盛，為前代重患。自單于在外，莫能牽制長卑。誘而致之，使來入侍。由是羌夷失統，合散無主。以單于在內，萬里順軌。今單于之尊日疏，外土之威寖重，則胡虜不可不深備也。聞劉豹部有叛胡，可因叛割為二國，以分其勢。去卑功顯前朝，而子不繼業，宜加其子顯號，使居鴈門。離國弱寇，追錄舊勳，此御邊長計也。」) Sanguozhi vol. 28. ^ (又陳：「羌胡與民同處者，宜以漸出之，使居民表崇廉恥之教，塞姦宄之路。」大將軍司馬景王新輔政，多納用焉。遷汝南太守，至則尋求昔所厚己吏父，乆已死，遣吏祭之，重遺其母，舉其子與計吏。艾所在，荒野開闢，軍民並豐。) Sanguozhi vol. 28. ^ (諸葛恪圍合肥新城，不克，退歸。艾言景王曰： ...) Sanguozhi vol. 28. ^ (... 「孫權已沒，大臣未附，吳名宗大族，皆有部曲，阻兵仗勢，足以建命。恪新秉國政，而內無其主，不念撫恤上下以立根基，競於外事，虐用其民，悉國之衆，頓於堅城，死者萬數，載禍而歸，此恪獲罪之日也。昔子胥、吳起、商鞅、樂毅皆見任時君，主沒而敗。况恪才非四賢，而不慮大患，其亡可待也。」) Sanguozhi vol. 28. ^ (恪歸，果見誅。) Sanguozhi vol. 28. ^ (遷兖州刺史，加振威將軍。上言曰： ...) Sanguozhi vol. 28. ^ (... 「國之所急，惟農與戰，國富則兵彊，兵彊則戰勝。然農者，勝之本也。孔子曰『足食足兵』，食在兵前也。上無設爵之勸，則下無財畜之功。今使考績之賞，在於積粟富民，則交游之路絕，浮華之原塞矣。」) Sanguozhi vol. 28. ^ (高貴鄉公即尊位，進封方城亭侯。毌丘儉作亂，遣健步齎書，欲疑惑大衆，艾斬之，兼道進軍，先趣樂嘉城，作浮橋。司馬景王至，遂據之。文欽以後大軍破敗於城下，艾追之至丘頭。欽奔吳。) Sanguozhi vol. 28. ^ (吳大將軍孫峻等號十萬衆，將渡江，鎮東將軍諸葛誕遣艾據肥陽，艾以與賊勢相遠，非要害之地，輒移屯附亭，遣泰山太守諸葛緒等於黎漿拒戰，遂走之。) Sanguozhi vol. 28. ^ (其年徵拜長水校尉。以破欽等功，進封方城鄉侯，行安西將軍。) Sanguozhi vol. 28. ^ (解雍州刺史王經圍於狄道，姜維退駐鍾提，乃以艾為安西將軍，假節、領護東羌校尉。議者多以為維力已竭，未能更出。) Sanguozhi vol. 28. ^ (艾曰：「洮西之敗，非小失也；破軍殺將，倉廩空虛，百姓流離，幾於危亡。今以策言之，彼有乘勝之勢，我有虛弱之實，一也。彼上下相習，五兵犀利，我將易兵新，器杖未復，二也。彼以船行，吾以陸軍，勞逸不同，三也。狄道、隴西、南安、祁山，各當有守，彼專為一，我分為四，四也。從南安、隴西，因食羌穀，若趣祁山，熟麥千頃，為之縣餌，五也。賊有黠數，其來必矣。」) Sanguozhi vol. 28. ^ (頃之，維果向祁山，聞艾已有備，乃回從董亭趣南安，艾據武城山以相持。維與艾爭險，不克，其夜，渡渭東行，緣山趣上邽，艾與戰於段谷，大破之。) Sanguozhi vol. 28. ^ (甘露元年詔曰：「逆賊姜維連年狡黠，民夷騷動，西土不寧。艾籌畫有方，忠勇奮發，斬將十數，馘首千計；國威震於巴、蜀，武聲揚於江、岷。今以艾為鎮西將軍、都督隴右諸軍事，進封鄧侯。分五百戶封子忠為亭侯。」) Sanguozhi vol. 28. ^ (二年，拒姜維於長城，維退還。遷征西將軍，前後增邑凡六千六百戶。景元三年，又破維於侯和，維却保沓中。) Sanguozhi vol. 28. ^ (四年秋，乃下詔使鄧艾、諸葛緒各統諸軍三萬餘人， ...) Sanguozhi vol. 28. ^ (四年秋，詔諸軍征蜀，大將軍司馬文王皆指授節度，使艾與維相綴連；雍州刺史諸葛緒要維，令不得歸。) Sanguozhi vol. 28. ^ (初，艾當伐蜀，夢坐山上而有流水，以問殄虜護軍爰邵。邵曰：「按易卦，山上有水曰蹇。蹇繇曰：『蹇利西南，不利東北。』孔子曰：『蹇利西南，往有功也；不利東北，其道窮也。』往必克蜀，殆不還乎！」艾憮然不樂。) Sanguozhi vol. 28. ^ (艾遣天水太守王頎等直攻維營，隴西太守牽弘等邀其前，金城太守楊欣等詣甘松。) Sanguozhi vol. 28. ^ (維聞鍾會諸軍已入漢中，引退還。欣等追躡於彊川口，大戰，維敗走。聞雍州已塞道屯橋頭，從孔函谷入北道，欲出雍州後。諸葛緒聞之，却還三十里。維入北道三十餘里，聞緒軍却，尋還，從橋頭過，緒趣截維，較一日不及。維遂東引，還守劒閣。鍾會攻維未能克。) Sanguozhi vol. 28. ^ (艾上言：「今賊摧折，宜遂乘之，從陰平由邪徑經漢德陽亭趣涪，出劒閣西百里，去成都三百餘里，奇兵衝其腹心。劒閣之守必還赴涪，則會方軌而進；劒閣之軍不還，則應涪之兵寡矣。軍志有之曰：『攻其不備，出其不意。』今掩其空虛，破之必矣。」) Sanguozhi vol. 28. ^ (冬十月，艾自陰平道行無人之地七百餘里，鑿山通道，造作橋閣。山高谷深，至為艱險，又糧運將匱，頻於危殆。艾以氊自裹，推轉而下。將士皆攀木緣崖，魚貫而進。先登至江由，蜀守將馬邈降。) Sanguozhi vol. 28. ^ (蜀衞將軍諸葛瞻自涪還綿竹，列陳待艾。艾遣子惠唐亭侯忠等出其右，司馬師纂等出其左。忠、纂戰不利，並退還，曰：「賊未可擊。」艾怒曰：「存亡之分，在此一舉，何不可之有？」乃叱忠、纂等，將斬之。忠、纂馳還更戰，大破之，斬瞻及尚書張遵等首， ...) Sanguozhi vol. 28. ^ (... 進軍到雒。劉禪遣使奉皇帝璽綬，為箋詣艾請降。) Sanguozhi vol. 28. ^ (艾至成都，禪率太子諸王及群臣六十餘人靣縛輿櫬詣軍門，艾執節解縛焚櫬，受而宥之。檢御將士，無所虜畧，綏納降附，使復舊業，蜀人稱焉。輙依鄧禹故事，承制拜禪行驃騎將軍，太子奉車、諸王駙馬都尉。蜀群司各隨高下拜為王官，或領艾官屬。以師纂領益州刺史，隴西太守牽弘等領蜀中諸郡。使於緜竹築臺以為京觀，用彰戰功。士卒死事者，皆與蜀兵同共埋藏。) Sanguozhi vol. 28. ^ (艾深自矜伐，謂蜀士大夫曰：「諸君賴遭某，故得有今日耳。若遇吳漢之徒，已殄滅矣。」又曰：「姜維自一時雄兒也，與某相值，故窮耳。」有識者笑之。) Sanguozhi vol. 28. ^ (十二月，詔曰：「艾曜威奮武，深入虜庭，斬將搴旗，梟其鯨鯢，使僭號之主稽首係頸，歷世逋誅，一朝而平。兵不踰時，戰不終日，雲徹席卷，蕩定巴蜀。雖白起破彊楚，韓信克勁趙，吳漢禽子陽，亞夫滅七國，計功論美，不足比勳也。其以艾為太尉，增邑二萬戶，封子二人亭侯，各食邑千戶。」) Sanguozhi vol. 28. ^ (艾言司馬文王曰：「兵有先聲而後實者，今因平蜀之勢以乘吴，吴人震恐，席卷之時也。然大舉之後，將士疲勞，不可便用，且徐緩之；留隴右兵二萬人，蜀兵二萬人，煑鹽興冶，為軍農要用，並作舟船，豫順流之事，然後發使告以利害，吴必歸化，可不征而定也。今宜厚劉禪以致孫休，安士民以來遠人，若便送禪於京都，吴以為流徙，則於向化之心不勸。宜權停留，須來年秋冬，比爾吴亦足平。以為可封禪為扶風王，錫其資財，供其左右。郡有董卓塢，為之宮舍。爵其子為公侯，食郡內縣，以顯歸命之寵。開廣陵、城陽以待吴人，則畏威懷德，望風而從矣。」) Sanguozhi vol. 28. ^ (文王使監軍衞瓘喻艾：「事當須報，不宜輙行。」) Sanguozhi vol. 28. ^ (艾重言曰：「銜命征行，奉指授之策，元惡旣服；至於承制拜假，以安初附，謂合權宜。今蜀舉衆歸命，地盡南海，東接吳會，宜早鎮定。若待國命，往復道途，延引日月。春秋之義，大夫出疆，有可以安社稷，利國家，專之可也。今吴未賔；勢與蜀連，不可拘常以失事機。兵法，進不求名，退不避罪，艾雖無古人之節，終不自嫌以損于國也。」) Sanguozhi vol. 28. ^ (鍾會、胡烈、師纂等皆白艾所作悖逆，變釁以結。) Sanguozhi vol. 28. ^ (會內有異志，因鄧艾承制專事，密白艾有反狀，於是詔書檻車徵艾。司馬文王懼艾或不從命，勑會並進軍成都，監軍衞瓘在會前行，以文王手筆令宣喻艾軍，艾軍皆釋仗，遂收艾入檻車。) Sanguozhi vol. 28. ^ (艾父子旣囚，鍾會至成都，先送艾，然後作亂。會已死，艾本營將士追出艾檻車，迎還。瓘遣田續等討艾， ...) Sanguozhi vol. 28. ^ (... 遇於緜竹西，斬之。子忠與艾俱死，餘子在洛陽者悉誅，徙艾妻子及孫於西域。) Sanguozhi vol. 28. ^ (泰始元年，晉室踐阼，詔曰：「昔太尉王淩謀廢齊王，而王竟不足以守位。征西將軍鄧艾，矜功失節，實應大辟。然被書之日，罷遣人衆，束手受罪，比於求生遂為惡者，誠復不同。今大赦得還，若無子孫者聽使立後，令祭祀不絕。」) Sanguozhi vol. 28. ^ (艾在西時，修治障塞，築起城塢。泰始中，羗虜大叛，頻殺刺史，涼州道斷。吏民安全者，皆保艾所築塢焉。) Sanguozhi vol. 28. ^ (九年，詔曰：「艾有功勳，受罪不逃刑，而子孫為民隷，朕常愍之。其以嫡孫朗為郎中。」) Sanguozhi vol. 28. ^ (評曰： ... 鄧艾矯然彊壯，立功立事，然闇於防患，咎敗旋至，豈遠知乎諸葛恪而不能近自見，此蓋古人所謂目論者也。) Sanguozhi vol. 28. ^ (三年，議郎段灼上疏理艾曰：「艾心懷至忠而荷反逆之名，平定巴蜀而受夷滅之誅，臣竊悼之。惜哉，言艾之反也！艾性剛急，輕犯雅俗，不能恊同朋類，故莫肯理之。臣敢言艾不反之狀。 ... 赦寃魂於黃泉，收信義於後世，葬一人而天下慕其行，埋一魂而天下歸其義，所為者寡而恱者衆矣。」) Sanguozhi vol. 28. ^ (世語曰：鄧艾少為襄城典農部民，與石苞皆年十二三。謁者陽翟郭玄信，武帝監軍郭誕元弈之子。建安中，少府吉本起兵許都，玄信坐被刑在家，從典農司馬求入御，以艾、苞與御，行十餘里，與語，恱之，謂二人皆當遠至為佐相。艾後為典農功曹，奉使詣宣王，由此見知，遂被拔擢。) Shiyu annotation in Sanguozhi vol. 28. ^ (世語曰：會善效人書，於劒閣要艾章表白事，皆易其言，令辭指悖傲，多自矜伐。又毀文王報書，手作以疑之也。) Shiyu annotation in Sanguozhi vol. 28. ^ (魏氏春秋曰：艾仰天歎曰：「艾忠臣也，一至此乎！白起之酷，復見於今日矣。」) Wei Shi Chunqiu annotation in Sanguozhi vol. 28. ^ (漢晉春秋曰：初艾之下江由也，以續不進，欲斬，旣而捨之。及瓘遣續，謂曰：「可以報江由之辱矣。」) Han Jin Chunqiu annotation in Sanguozhi vol. 28. ^ (世語曰：師纂亦與艾俱死。纂性急少恩，死之日體無完皮。) Shiyu annotation in Sanguozhi vol. 28. ^ (杜預言於衆曰：「伯玉其不免乎！身為名士，位望已高，旣無德音，又不御下以正，是小人而乘君子之器，將何以堪其責乎？」瓘聞之，不俟駕而謝。) Han Jin Chunqiu annotation in Sanguozhi vol. 28. ^ (先是以艾孫朗為丹水令，由此遷為定陵令。次孫千秋有時望，光祿大夫王戎辟為掾。永嘉中，朗為新都太守，未之官，在襄陽失火，朗及母妻子舉室燒死，惟子韜子行得免。千秋先卒，二子亦燒死。) Shiyu annotation in Sanguozhi vol. 28. ^ (世語曰：咸寧中，積射將軍樊震為西戎牙門，得見辭，武帝問震所由進，震自陳曾為鄧艾伐蜀時帳下將，帝遂尋問艾，震具申艾之忠，言之流涕。) Shiyu annotation in Sanguozhi vol. 28. ^ a b c de Crespigny (2007), p. 109. ^ a b (春，正月，壬辰，詔以檻車徵鄧艾。 ...) Zizhi Tongjian vol. 78. ^ Declercq (1998), p. 175. Declercq, Dominik (1998). Writing Against the State: Political Rhetorics in Third and Fourth Century China. New York: Köln Brill. Yuan, Tingdong (1988). War in Ancient China (first ed.). Chengdu: Sichuan Academy of Social Science Publishing House. ISBN 7-80524-058-2.